In order to completely analyze data structure on an object, it must be scanned. Any object on the Drives panel can be scanned. In addition, you may create a region to scan only a part of an object. The Regions topic explains how to create and work with regions . Scan is also greatly improves estimations for chances of successful file recovery . You may select scan area and some other scan parameters. Scan information may be saved to a file and later this file may be opened. You may save scan information on the remote computer if necessary. Attention: Scanning large areas may be a very lengthy process! NEVER TRY TO SAVE SCAN INFORMATION TO THE OBJECT BEING SCANNED!!! Specifies the file systems which objects are to be searched for. 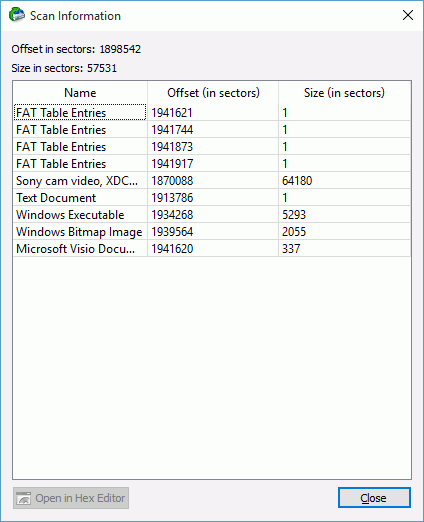 Current version supports: FAT, NTFS, exFAT, ReFS, Ext2/3/4FS, HFS, APFS, and UFS file systems. Please note that if you need to scan an HFS, HFS+, or HFSX disk, always enable the Extra search for Known File Types option. This is very important because when files are being deleted on the HFS, HFS+, HFSX file systems, the computer completely removes all system information on them, and there is no way to recover the deleted files except by using the Extra Search for Known File Types option. See Data Recovery on HFS/​HFS+ file system for details. Enables search for Known File Types . If this checkbox is selected, R‑Studio will save scan information to a specified file. Later this file may be opened. Please note, that this option does not save actual disk data, only information on disk data structure gathered during disk scan. If this option is selected, R‑Studio will show only scan progress. If this option is selected, R‑Studio will show graphic representation on objects found during scan. 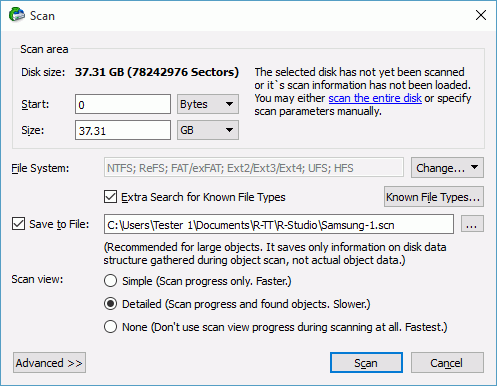 If this option is selected, R‑Studio will not show the Scan Information tab during scan. Selects file types that R‑Studio will recognize during the disk scan. and the Save Scan Information File dialog box will appear when you select a place to store scan info. You may save it to the local or remote computer. Known File Types (raw file search) : While scanning, R‑Studio can recognize the data’s particular file type . Using such information, R‑Studio can obtain more information about data/​file structure on the object being scanned. 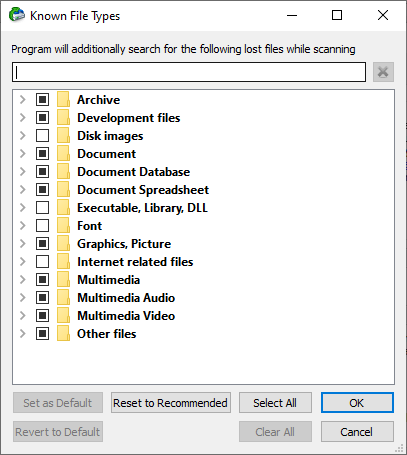 By default, R‑Studio tries to recognize the default list of supported file types specified on the Known File Types tab of the Settings panel , greatly increasing time required for the scan. You may reduce it by selecting only those file types that you need. Click the Known File Types... button and select the required file types on the File Types dialog box. These selections will be applied to that scan session only. R‑Studio places such found files in the Raw Files section on the the Drives panel. Click this button to set the current list of selected file types as default values. Click this button to revert the default settings specified on the Known File Types tab of the Settings panel. Click this button to revert to factory-preset default settings. Note : Using scan for Known File Types, R‑Studio can successfully recover only un-fragmented files. You may also specify your own file types for scanning. See Customizing File Types for details. User-defined file types precede over built-in ones, if their definitions overlap. You may set the defaults for known file types on the R‑Studio Settings . The Log pane will show scan progress. Scan may be stopped by clicking the Stop button on the toolbar. Later the scan process may be resumed with different scan parameters. You may see which file object(s) is/are on a particular disk part. Click the corresponding rectangle on the Scan Information pane and view the information on the Scan Information dialog box. Double-click an object to view/​edit the file object in the Text/​hexadecimal editor . When an object is scanned, a number of Recognized partitions will appear. R‑Studio shows them in different colors depending on which elements of the partition have been found. To see the information about a newly found object, simply click it on the Drives panel. Click this link to see the information about the object Recognized13 on the logical disk H: . All scanned information may be deleted on the shortcut menu for a scanned object. Scan information may be saved in a file. Previously saved scan information may be loaded. This can be done on the Drive or shortcut menu for a selected object. If the selected object has been completely scanned, you may rescan it either completely or with new scan parameters. If the selected object has been scanned partially, you may scan the rest of the object, ignore the existing scan information and scan the entire object, or specify scan parameters manually. R‑Studio accumulates the information from successive scans and keeps track of changes in this information obtained from different scans. You may make several scans of successive or overlapping areas. Click the Advanced button, specify an offset and size for a new area to scan on the Advanced Scan dialog box and click the Add button. You may specify and add several scan areas. You may select which areas should be scanned. Selected scan areas can be merged. Right-click a necessary area and select either Merge Down , Merge Down All , and Merge Selected . Scan information may be saved to a file. Previously saved scan information may be loaded. The default file extension is *.scn. If a remote computer is connected for Data Recovery over Network , the Save Scan Information File dialog box will appear when you select a place to store scan info. You may save it to the local or remote computer. 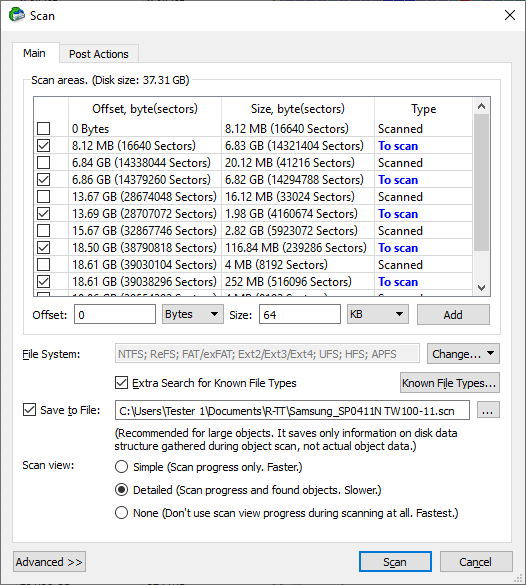 If a remote computer is connected for Data Recovery over Network , the Open Scan Information File dialog box will appear when you select a place to load scan info from. You may load it from the local or remote computer.